"It was a situation that should have never happened," Ashley Mewborn, the victim's mother said. "A child shouldn't have been able to walk in with a gun and be able to shoot my baby in his, just shoot him in his side and kill him." 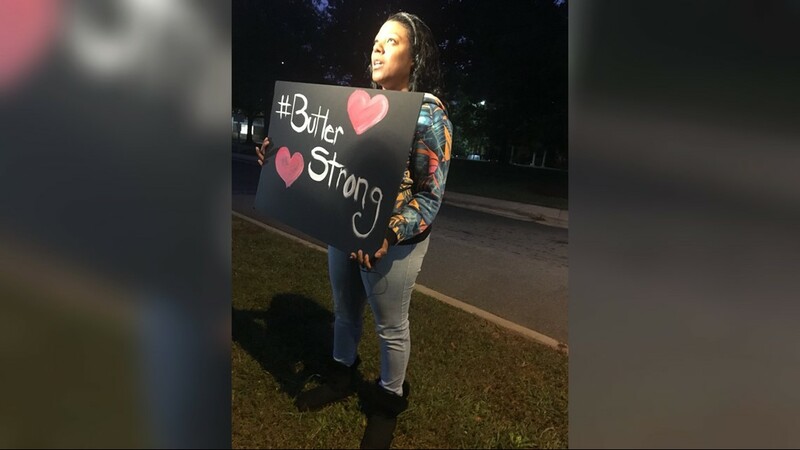 MATTHEWS, N.C. — Last week, countless lives were changed forever when one Butler High School student killed another during a fight in the school hallway. In the days to come, WCNC learned of the fight that led up to the fatal shot, how the stolen gun was retrieved and how the school reacted. Students returned to school on Thursday, but many say they still don’t feel safe as they mourn the loss of one of their own. Jatwan Cuffie admitted in court documents he was involved in a fight with others in the Harris Teeter parking lot near Margaret Wallace and Idlewild Road. Cuffie, 16, and a friend were reportedly fighting two teens. After a knife was pulled out, Cuffie told police he and his friend ran away. While not directly involved in Friday’s fight, court documents say that 16-year-old Bobby McKeithen witnessed the fight. According to court documents, after the fight, Cuffie told police he was talking to Jaylyn, who he fought. Cuffie asked him who he thought won the fight. Jaylyn reportedly said he didn’t know, and advised him to ask McKeithen. According to Cuffie​​​, McKeithen thought Lucas had beaten Cuffie​​​​​​. Cuffie said he texted McKeithen that he only thought that since he was with the other guys involved. Cuffie said AJ then called him, saying he wanted another fight in the Harris Teeter parking lot. Cuffie told police he responded that he wasn’t “tripping” anymore. Three hours later, he received a text saying AJ was planning to fight on Monday. Cuffie later allegedly received a text from a friend, asking if he had any issues with McKeithen. Cuffie said he didn’t text back. According to Cuffie​​​​​, he was “praying that they wouldn’t mess with him.” He put the gun in his pocket and walked to the school bus. Once he got to school, Cuffie told officials he stood in a corner. He said he then spotted McKeithen, who allegedly punched Cuffie in the left side of his face. According to court documents, Cuffie told police he put his arm up to protect himself, then grabbed the gun from his pocket and shot McKeithen once. Cuffie told police he then grabbed the gun. Not seeing any blood, he said he thought he missed McKeithen the first time. Students were placed under a lockdown until the scene was cleared. Parents, who largely found out about the events from their frightened children, gathered at a nearby church and later demanded the release of their children. At least one student was suspended for trying to escape during the lockdown. Dr. Wilcox later defended the school’s decision to lockdown and keep kids on campus, saying the "decision to keep students on campus and in class was motivated by one goal: to keep students safe until transportation could be arranged with their families." Cuffee made his first court appearance Tuesday afternoon. The freshman is facing first-degree murder charges in the death of classmate McKeithen. He was denied bond by a judge and given a court-appointed attorney. According to police, Cuffie used a stolen gun to shoot and kill McKeithen as the two fought in the hallway. The day before students were to return to Butler High School, the community was still processing the events of Monday. The Charlotte-Mecklenburg Police Department released the official court documents, detailing what Cuffie said lead to the deadly shooting. According to police, Cuffie waived his rights and provided a statement. You can read Cuffie's full statement here. Also on Wednesday, a local graffiti artist was moved to helping Butler High after hearing about Monday’s events. Abstract Dissent spent 10 hours painting a 60-foot mural, with the hopes that students would have something empowering to see. 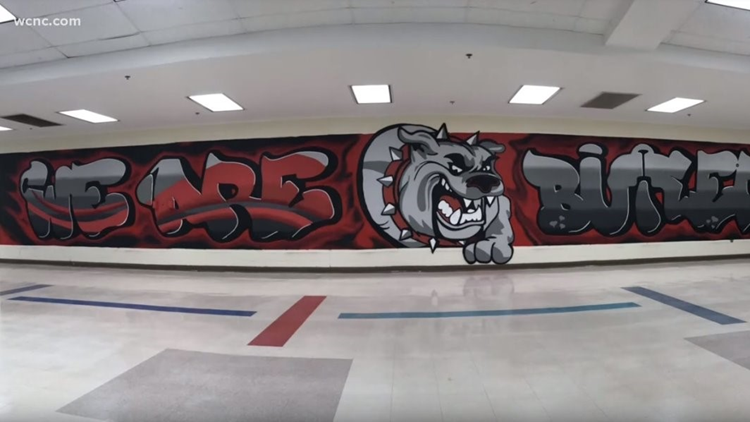 "This went with my cause and my purpose so I called the school and told them I wanted to donate a mural," the artist said. "The bottom line is we need to start treating each other a little better. Maybe if we find things we can relate to instead of our differences," the artist wrote on Facebook. 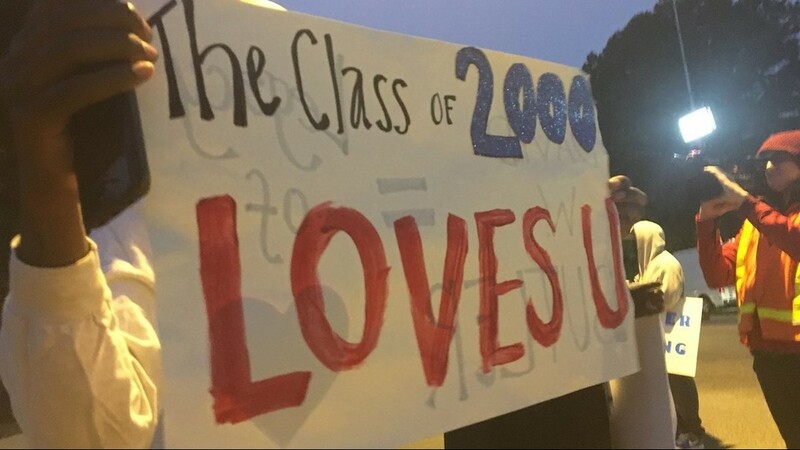 Emotions were high as students returned to Butler High on Thursday. 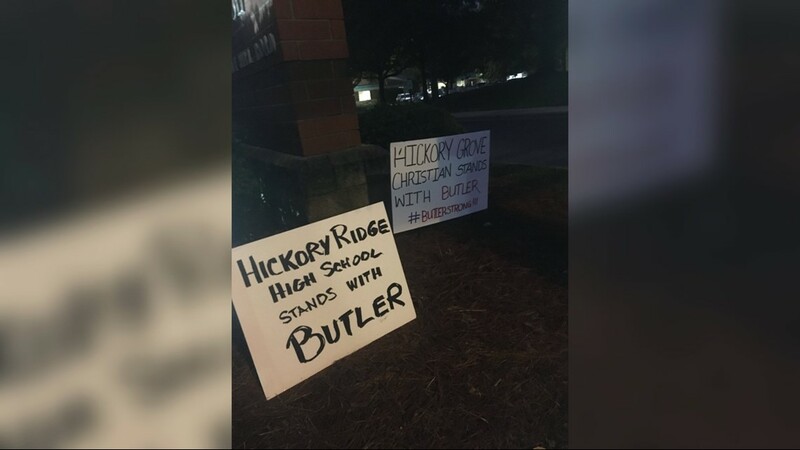 Parents, students and Butler High School alumni gathered early Thursday morning with encouraging signs to welcome students back. “We just wanted them to know that even though world may have moved on, that we haven't and that we’ll be here for them in the days to come,” one woman said. 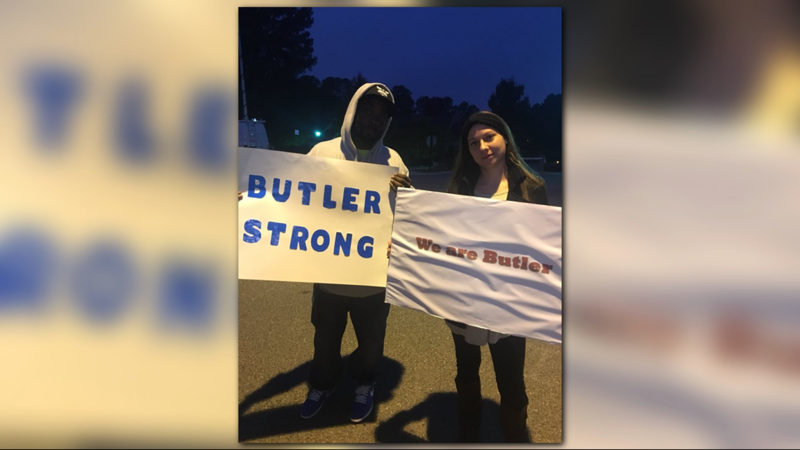 Parents, students and alumni of Butler High School welcomed students back to class Thursday for the first time after the shooting death of 16-year-old Bobby McKeithen. "I think whether you knew him or not you're still hurting," said Blake Elizalde, a senior at Butler High. "He was part of the community. He was part of our school." Charlotte-Mecklenburg Schools Superintendent Dr. Clayton Wilcox thanked the local communities for the immense support for students and faculty since Monday. 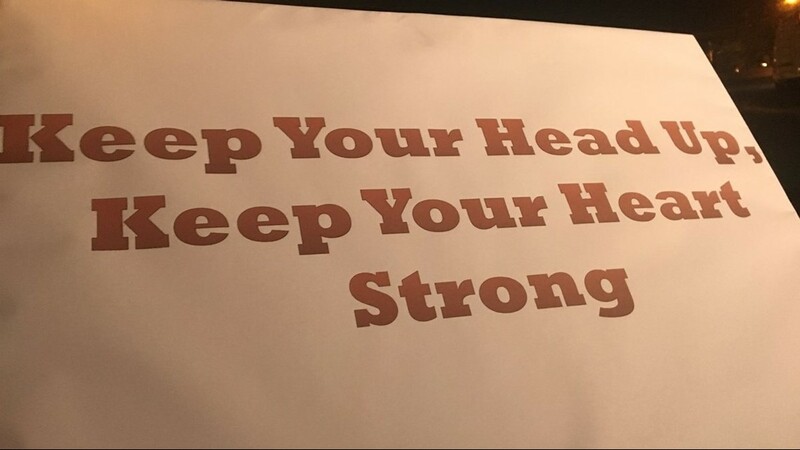 "The principal is meeting with every student in school to talk about the fact that we have to come together as a community," Wilcox said Thursday. According to Charlotte-Mecklenburg Schools, crisis counselors were on hand, and there was a heavy Matthews Police presence at schools in the town. While parents and alumni were providing emotional support for returning students, not every student felt welcome going back. Williams said they went around police during the lockdown and ran screaming from the building. Later that evening, Butler families and community members gathered for a candlelight vigil in honor of the late McKeithen. Tensions still high in the surrounding community, two 17-year-old students at Cabarrus High School were arrested for bringing a firearm to campus. According to Charlotte-Mecklenburg Schools, crisis counselors were on hand for students. Family and friends of McKeithen said their final goodbyes Saturday at a service in Charlotte. A line of people reportedly went out the door most of the morning for the visitation. “I want you to know I am completely heartbroken about what happened on our campus,” Butler High School Principal John Legrand said. “Above all we are going to miss Bobby." School administrators said midterm exams have been rescheduled for Butler High School, saying the top priority is making sure students' social and emotional needs are met during this time. Other schools in the Carolinas have been considering higher security after the week’s events. No immediate changes to security have been announced, but Superintendent Wilcox says metal detectors and other procedures are being discussed. Wilcox said Thursday that CMS officials are considering a town meeting for parents of students across the district to discuss plans to keep students and faculty safe.Principal Legrand said they would use this experience to cause a positive change at the high school, saying “We have no choice. Like I told our students as they returned Thursday, 'Enough is enough.'"